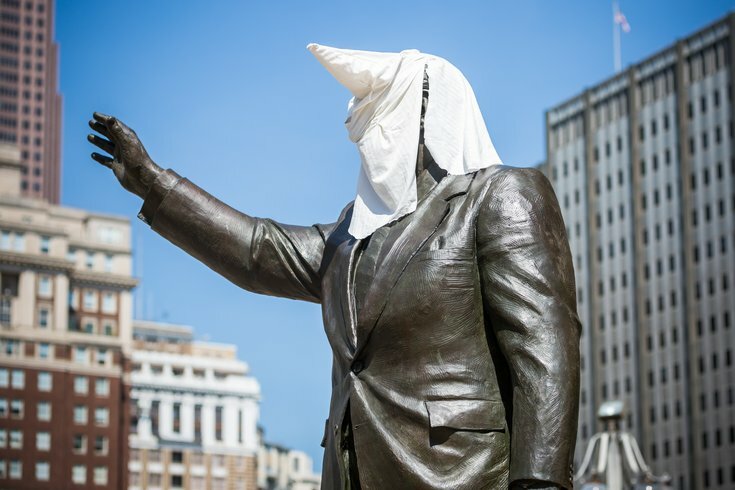 In something of an anemic protest against what they called the "racist" actions of a former Philadelphia mayor, two protesters draped a white hood over the head of a statue of Frank Rizzo on Friday morning. Calling for removal of the statue from the plaza at the Municipal Services Building, across from City Hall, Black Lives Matter activists Asa Khalif, 34, of Center City, and Dana Witengier, 29, of Old City, pulled a Ku Klux Klan-like hood over the head of the statue around 11:30 a.m.
"Rizzo brutalized black and brown people. Rizzo brutalized homosexuals," Khalif shouted as he prepared to place the hood. "He was a complete terror." Rizzo was mayor of Philadelphia from 1972 to 1980, and police commissioner from 1967 to 1971. Friday's protest came on the heels of an online petition — with 976 signatures, so far – calling for the removal of 10-foot-tall bronze statue by Philadelphia sculptor Zenos Frudakis. Created by Erica Mines, a noted Philadelphia-based Black Lives Matter activist, the petition cites his handling of the evacuation of the black activist movement MOVE from their home in 1978 and a 1970 raid of an office of members of the Black Panthers as reasons he should not be immortalized. "This statue has to come down," said Khalif. "It should have never been built, and even if it's been built, it shouldn't have been put here." Khalif said he came up with the idea of putting a hood on the statue after talking with his grandmother late one night this week. While he'd like to see the statue torn down, Khalif said he decided to place the hood, in lieu of breaking the law. "I wish I could just take a brick to it and have it torn down," he said. "But who am I to tear it down? That's against the law." As the wife of a Latino husband, Witengier said her family has been victims of racial oppression and she wanted to support Khalif in his protest. "This is what I do," she said. "We've experienced a lot of racial violence in my family, so, I wanted to be here." On a hot summer day — the temperatures pushed above 93 degrees at noon — few onlookers paid much mind to the pair protesting at the statue. In fact, members of the news media far outnumbered both protesters and onlookers. One woman spoke up in support of Rizzo as the hood was put in place. "This is disrespectful," said the woman, who asked not to be named. "He did a lot for this city." If the protesters wanted to remove statues to Philadelphians who may have been racist, she said, they should consider other statues, as she pointed to the figure of William Penn atop City Hall. "You're going to have to tear every statue down," she said. "But by doing that, then you're just as racist." "The stated goal of the petition is 500 signatures. The late Mayor Rizzo means something, both good and bad, to many more Philadelphians than that," Kenney said. "I'm happy to have a dialogue about the future of Rizzo's likeness in relation to its location, but that dialogue won't be started and finished over a few days and a few hundred signatures." As the protest wound down and Khalif said he planned to leave, police officers watching the scene moved in to surround the statue. Within seconds, the hood, which was in place for about 45 minutes, had been removed.